It seems highly unlikely today that William S. Hart could ever have achieved the iconic status he possesses in cinema culture. Even during his heyday, he was viewed by some critics and moviegoers as stolid, horse-faced, with an emotional disposition of slight but disquieting constipation (1). However, an aggregation of personal qualities and external circumstances propelled him to the forefront of the national consciousness. In 68 films created over a mere 11-year span (1914-1925), he crafted an authoritative and compelling archetype, and created a moral/mythic context for film Westerns that still defines the genre today. Hell’s Hinges is his most emblematic film, one whose simple power and apposite impulses transcend its most egregious clichés. It is at once reactionary and revolutionary, a film in which deeply felt piety gives its bearer license to unleash Armageddon – an emblematic American gesture that would find its way into other genres, and even invade the historical realm. Like many who upheld the mythos of America’s Old West, Hart was an Easterner. He was born in Newburgh, New York, in 1864. His father was an itinerant miller, and his impoverished family travelled widely during his childhood. Some of this time was spent in the West and Midwest, at the tail end of the frontier period. Though it is likely that his contact with this rapidly vanishing culture was glancing and superficial, the shy, daydreaming youth later inflated these memories, beefing them up into a recalled childhood that teemed with intimate contacts with Indians and famous frontiersmen. Hart would parlay this sense of anointment into a weighty sense of self-importance and authenticity in his work. Hart spent nearly 25 years on American stages, working himself up into the leading ranks of Broadway performers. Adept at Shakespeare, he made his name as the original Messala in the first theatrical version of Ben-Hur. Then, in 1905, he filled his first Western role – that of the villainous Cash Hawkins in a production of The Squaw Man. From then on, “audiences… associated him with cowboy characters” (2). In 1913, Hart was on tour in Cleveland, Ohio, when he saw his first Western film. “It was awful!… I was an actor and I knew the West…. The opportunity that I had been waiting for years to come was knocking at my door.” (3) Within a year, Hart set out for California and the movie business. By the time Hell’s Hinges was made, Hart had appeared in 25 films, and captured the audience’s imagination, becoming one of film’s first genuine stars. In this, he was fortunate to fall in with pioneer film producer, and former fellow thespian, Thomas H. Ince, who applied the techniques of Ford’s assembly line to the nascent movie industry, cranking out a massive amount of product in an efficient manner – presaging the Hollywood system (4). Given his head (and grossly underpaid) by Ince, Hart brought new qualities to the Western, which previously had been best known for chases, scenes of gunplay, and the broad emotionalism of actors such as “Broncho Billy” Anderson (another New Yorker, nee Max Aronson). Although the theme of the bad man achieving redemption through sacrifice was not unknown in the Western, Hart’s restrained gravity on screen gave new weight to the as-yet-uncliched figure of the domesticated outlaw. Hart’s subdued intensity was a marked change from the over-the-top histrionics of his predecessors. His practiced skill at manipulating an audience was honed through his incessant film work. Though his hamminess breaks through at times, the essential, “manly” stillness of his screen persona would be imitated by countless followers – most notably John Wayne. Hart’s performances were also imbued with the sentiments of the Victorian era – giving a strangely stilted, almost Puritanical bent to even his most vicious characters. In the Hart universe, women are either cat’s-paws of evil or vessels of light, to be spurned or worshipped. Children are devices to rouse pity and inspire sacrifice. In Hell’s Hinges, the simple cowboy film becomes a vehicle for an epic confrontation between good and evil. The actions of men, or their tragic inability to act, dominate here. Hell’s Hinges opens with the depiction of an anti-hero in unique garb – that of a minister. “Bob” Henley (Jack Standing), seen preaching to an assembly of adoring women, is characterised in the film’s intertitles as a mother-dominated, “weak and selfish youth”. Accompanied by his not-so-subtly-named sister Faith (Clara Williams), Henley finds himself in, not Hell, but a remarkable facsimile thereof. (The brother/sister relationship eerily echoes Hart’s own life. Frequently engaged, briefly married, he spent most of his life with his sister Mary Ellen, who jealously tended him (5).) An introductory gunfight, taken in an overhead long shot, emphasises the chaotic, antlike scurrying of the town’s inhabitants. As was common in the Old West, Placer Centre – better known as Hell’s Hinges – is dominated by the pleasure palace of Silk Miller (Alfred Hollingsworth), who is characterised with casual racism as part Mexican, part snake. As the town’s Mephistopheles, he will bring all his evil talents to bear on destroying Christianity and its followers. Tracey’s resolve to run the preacher out of town is stymied by his instant attraction to Faith. His poleaxed gaze at her is accompanied by the intertitle: “One who is evil, looking for the first time on that which is good.” At that point, the film’s double set of parallel actions kicks into gear. Henley’s fall is inevitable, as is Tracey’s rise and redemption. Later, in contrast to Henley’s salacious earlier fantasy, Tracey has a vision of the proverbial old rugged cross. The spiritual coterie builds its church, with Tracey’s help – his conversion process is punctuated by a simple, affecting scene of him reading the Bible, cigarette in one hand, bottle of whiskey at his side. Ironically, Henley’s turn to drink renders him a near-imbecile, and when the town rowdies shout, “To hell with the church! Let’s burn her down!”, Henley gleefully snatches up a torch and leads the way. 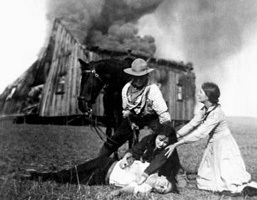 A pitched battle results in Henley’s death, the expulsion of the faithful, and the immolation of the church – in one of the film’s many powerful images, Faith weeps over her brother’s corpse in the foreground, while behind, smoke boils and hurtles, wind-whipped, from the isolated figure of the burning house of worship. The final sequence is undoubtedly what propelled the film to eventual inclusion on America’s prestigious National Film Registry in 1994. “Killin’ mad, and with a gun in each hand”, Tracey, who’s been conveniently out of town during the battle, hears of its outcome from a ragged band of refugees (what happens to the expelled “petticoat brigade”? we are never informed) and returns to settle the score. His extermination of Miller is offhand – blink and you’ll miss it. Filled with a new-found, (self) righteous vengeance, Tracey becomes a bloodthirsty, vindictive embodiment of both the “social gospel”, a popular 19th century kind of spiritual Manifest Destiny, and its coefficient, “muscular Christianity”, which basically gave its proponents license to whip the tar out of scoffers, nonbelievers, and those of other faiths. Rivetingly, Tracey backs the saloon’s ne’er-do-wells into a corner and shoots down the oil lamps, turning the building into an inferno (“Hell needs this town, and it’s goin’ back, and goin’ damn quick!”). Shooting down those who try to bolt, he holds the men at gunpoint until the last possible second, then allows them to flee. Remaining behind, Tracey then seems to break focus, wandering distractedly, the flames leaping up behind him. Some judicially placed flares of combustible material to the rear give Hart a hellish nimbus. It’s almost as though his descent into violence has temporarily transformed him into a demon as well, later echoed in Eastwood’s similar climax in 1992’s Unforgiven. Hart strides out of the building and into the streets, moving toward the camera robotically, a death-dealing machine, like some ur-Terminator. Cowpokes and dance-hall girls scatter amid the swirling smoke, “like vague demons in some primitive hell” (6), as the entire town burns to the ground. There is redemption for Hart alone, and it’s savage. In a peculiar foreshadowing of the Vietnam experience, he destroys the village in order to save it. No wonder so many claimed the director’s credit for the film – although Charles Swickard is officially cited, it is generally acknowledged that Hart directed at least most of the film, with the help of long-time assistant Clifford Smith. Ince took credit for helming the fire scenes (7), but the extraordinary strength of the film’s compositions can probably be credited to Colorado-born photographer Joseph H. August, who shot over 40 of Hart’s films and went on to be an Oscar-winning cinematographer of such Hollywood classics as The Informer (John Ford, 1935), The Hunchback of Notre Dame (1939, William Dieterle, starring Charles Laughton), and Gunga Din (George Stevens, 1939) (8). The climactic fire sequence was shot “day for night”, although prints without the colored gels that indicate day and night scenes make this difficult to remember. At film’s end, Tracey takes up Henley’s body, and Faith’s hand, leading her into the distance. Though there is a conventional happy ending in sight, what’s gone before has tainted it, and thrown the film’s premise out of joint. Slaughter and wholesale destruction is sanctified by religion… or is it? In this wildly popular film, the audience got to have its cake and eat it too – a dangerous addiction that would crop up, for better or worse, again and again in American cinema. Andrew Brodie Smith, Shooting Cowboys and Indians: Silent Western Films, American Culture, and the Birth of Hollywood, University Press of Colorado, Boulder, 2003, p. 183. William Surrey Hart, My Life East and West, B. Blom, New York, 1968 (reprint of 1929 ed., Houghton, Mifflin, Boston), pp. 198-199. Diane Kaiser Koszarski, The Complete Films of William S. Hart: A Pictorial Record, Dover Publications, New York, 1980, p. xv. Ronald L. Davis, William S. Hart: Projecting the American West, University of Oklahoma Press, Norman, 2003, passim. George N. Fenin and William K. Everson, The Western, from the Silents to the Seventies, Grossman, New York, 1973, p. 91. Kevin Brownlow, The War, the West and the Wilderness, Knopf, New York, 1978, p. 270. Robert S. Birchard, “The Founding Fathers”, The American Society of Cinematographers Web Site, 2004. Brad Weismann is a staff member of the Boulder International Film Festival, as well as a writer and editor.